A string of vandalism cases have been reported by churches nationwide this month, from Georgia and North Carolina to Texas and California. Windows were smashed at both Yeoman’s church, and nearby Blackwell Chapel AME Zion Church, over the weekend. Two windows on the front of Providence Missionary Baptist Church had been broken, and both front doors, two front windows, and a side window were smashed at Blackwell Chapel AME Zion Church. In Flat Rock, North Carolina, someone spray painted graffiti on Upward Baptist Church earlier this month, sprawling across the building, “[expletive] Jesus” and “[expletive] Billy Graham + diabolic delusive ‘divinity.” The first phrase was also painted on the church’s sign. “We’ll be praying about it, praying for them. Pray that the community would … show people that there’s still a lot of godly people in this town that love the Lord and serve the Lord,” Wilburn Lefler, the pastor of the church, told WLOS-TV. In McDonough, Georgia, someone spray painted satanic symbols inside of Seed Planters Church, a newly-owned facility that hasn’t even opened for meetings yet. The door of the church had apparently been pried open by the perpetrator. 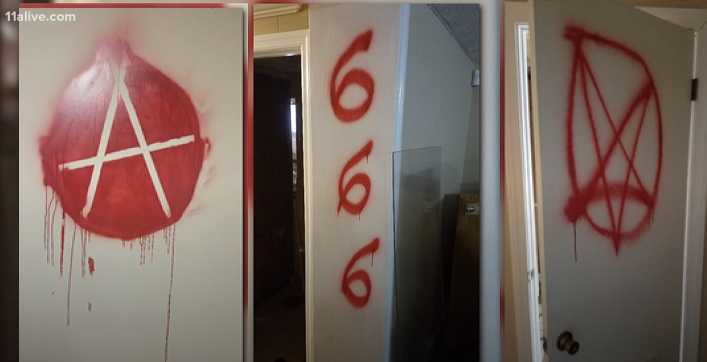 FOX5 Atlanta reports that the numbers “666” and the letter “A” were painted on the walls, and someone drew a pentagram with a face inside, along with the words “Hail Lucifer” written both forward and backward. “I want to invite you to become a part of this community, because I believe that you need help, and that we can help and build a stronger community together,” Daunte Long, the pastor of Seed Planters Church, stated to the vandal through the media. Earlier this month, someone used what appears to be a marker to write the phrase “[expletive] Christians” and “phoneys” on the doors of the Jasper Pentecostal Church and St. Paul Lutheran Church in Jasper, Texas. “When I was a kid, I would’ve never thought that things like this would happen, but they are,” Mark Follett, the pastor of St. Paul Lutheran Church, told KTRE-TV. This past week, a man in Boulder Creek, California was arrested after he was believed responsible for satanic graffiti defacing Boulder Creek Community Church, as well as St. Michael’s Roman Catholic Church. “Hail Satan,” “666” and upside down crosses were painted across Boulder Creek Community Church, and similar language was written on the Roman Catholic facility, along with homosexual-related slurs. Police state that they were able to track down vandal Rollin Easley, 33, after he was captured on surveillance footage purchasing spray paint at a local hardware store.